Bhopal, a city, which continuously evokes a charm of old even though it s seeped in new is rich in culture and history, handed down from the Peshwa and Nawabi legacies. The Nawabi history of the city influences it food culture. The city believes in having breakfast for biryani and end the day with kormas, kebabs, roasts, fresh breads, and much more. Also evident is the rule of the Marathas from the famous street side Poha stalls. 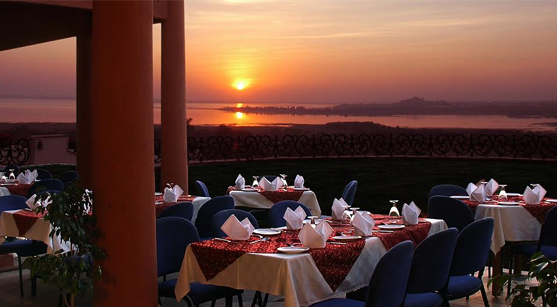 From 5 star hotels in Bhopal to every the street food stalls, be ready for a happy stomach when you visit this beautiful heritage city. That Bhopal has a rich history is much evident from its food. A Maharashtrian specialty, Poha, found its way to the city through the Peshwas. In Bhopal, exclusively, the soft poha is generously topped with crunchy sev or sweet and crispy jalebis. This light breakfast is traditionally an import from Indore and even Pune, and the rest just adds the right amount of power and crunch and makes this special Bhopali breakfast of legendary. Poha is available in almost every alternate store, in both the Old as well as the New City. For a true-blue food experience in the city, Sarafa Bazar, with lots of colourful shops, is the finest destination. The bazaar is simply a foodie’s paradise with lots of street food. The Dahi Vadas are created nearly out of thin air, some tossing and twisting in the air, mix of spices; and then finally, when the plate is handed over to you, taste the crunchy, tangy, spicy dahi vada…it tickles all the taste buds in the mouth! One of the specialties of the Chatori Galli is the super delicious Bun ke Kebab. The meat-loaded buns made with tender Mutton Kebabs are stuffed in a bun and are simply a treat. All day long, the mutton is marinated and then pounded to pulp. In the evening, the kebabs are then fried on the tawa, and then stuffed in a bun, served with lots of chillies, chutney and onions. Thick bun and the so very succulent meat kebab make for a divine treat. It is only in the evening that the city’s food space seems to rise after a long day of much preparation, which goes into the succulent meat dishes. But before you visit the famous Chatori Galli for some meaty affairs, you need to try out this classic Bhopali dish called Barfi Rasmalai Dona. The delightful dessert actually is crushed ice, wit topping of creamy, thick rabri, a delightful sweet syrup and lot of sprinkled rose water. The dessert has all ingredients which make up for a Nawabi treat. So, the next time you are in Bhopal, do not fail to try these exclusive street foods from the city. But do not forget to go with an empty stomach!